The drive through Zimbabwe itself is a highlight as the scenery is beautiful. Hwange National Park is very pleasant. 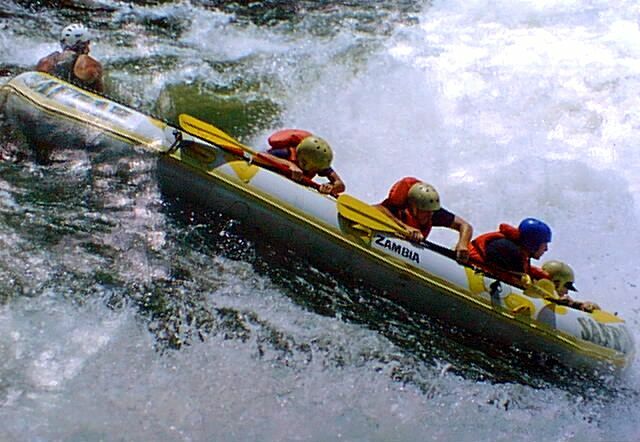 White water rafting is an absolute 'must'.!! Beitbridge is the only border post between SA and Zim and was busy but efficient. We were able to buy 3rd party car insurance for a grand total of £2.30 for the month but still had to show customs what to do with the carnet. We had another day of driving and driving and driving. Passed through Bulawayo which is the second largest town in Zim and very pretty indeed. 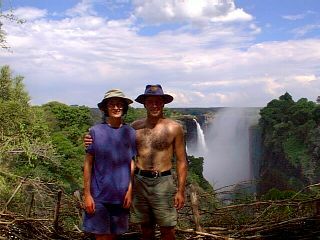 We had planned to go straight to Vic Falls but then decided to take a detour and visit Hwange National Park. Up until a few years ago the town and park of Hwange was spelt and pronounced "Wankie"! There are still signs with the name on it. The area around Hwange is absolutely beautiful with rolling hills, African style huts and children and goats sharing the roadside kopjes (rock formations). Elephants playing in the water and giraffes blocking the road welcomed us to the park in a more hospitable manner than the office chap who explained that we were very late and that we were lucky that he was still there to take our booking. The fact that his office didn't close for another 30 minutes and that he was twiddling his thumbs when we arrived was irrelevant. He still willingly took our US$40 park entrance fee! Anyway we located the camping area, fended off the insects then headed to the bar and restaurant for dinner. The restaurant is on an elevated platform with 50 km views which we were able to enjoy in the daylight of the following morning. The views were stunning although there were no big game to be seen - only the resident squirrels and dassies which don't really count. After breakfast we drove towards Robins Camp via a number of tracks taking us past a numerous watering holes, crocodile pools and scenic picnic spots. The bush was quite dense and our viewing limited to impala, ridiculously stupid zebra, basking hippos and a number of crocs with their mouths gaping in anticipation of a good feast. One section was incredibly muddy and provided a few opportunities for play in Punda. We wondered how the 2WD cars would make it through because there was no indication that 4WD was recommended. However when we reached the end of the section it was cordoned off. No-one had thought about blocking off the entry! You could be stuck for weeks in these parks and nobody would miss you. We had planned to camp here for another night but the reduced ability to see the animals meant that we changed plan and headed up to Vic Falls instead. The town of Vic Falls is very small but very commercial and you are immediately pounced on by locals wishing to sell you hash, exchange money or "introduce" you to an activity company (i.e. they follow you into the shop and claim commission). We made temporary camp at the grotty municipal site in town. It was convenient for researching the rafting companies. Another British couple from Widnes - Jeff and Lisa were parked up next to us and we spent some time chatting to them. They are off around Africa, India then Australia. We spent the next day checking out the sights around the town. The Falls are one of the most spectacular sights I have ever seen. At the top of the Falls you get what appears to be flat calm areas with green low lying islands which look fun to canoe around. Then you get this massive drop. At this time of the year the flow is just starting to build up and you can get an incredible view whilst avoiding getting drenched. The rainbow displays over the Falls are beautiful as you walk along the path. Where the spray is greatest you find tropical vegetation growing in the humid environment. Where there is no spray you find savannah type vegetation. It is like walking from desert to rainforest and back again. We spent the night at a much better campsite (Inyathi) just out of town. Sadly there was no camp bar but they did have a lovely pool which provided an opportunity for a midnight skinny dip! Rude not to really. (Watch out for the water scorpions). c) You get a bacon buttie breakfast. It was the latter that swung it for us! In fact, Saf Par appeared to provide the most professional service of all the companies. Once the usual briefing and the sign your life away business was over we soon found ourselves kitted up and climbing into the raft. Thankfully the water was really warm so it was pleasant to fall in - and we had a lot of practice. We had booked a whole day trip which included three meals, beers and transport. It was fifty quid each and worth every penny. Saf Par provided an excellent days fun and hospitality. All the rapids are given names and we quickly found ourselves at no.1 "the boiling pot" and practising our manoeuvres - how to avoid whirlpools and how not to drown. The rapids are graded on a scale of 1-6, the latter being the most lively. We were to experience up to grade 5 and it wasn't long before we actually reached our first grade 5. First you paddle, then you hold on, duck and pray as you lunge into the frothy experiences given names such as "overland truck eater", "oblivion" and "the washing machine". Rapid no. 8 is known as "midnight diner" where you are given the option of three approaches and three very different experiences. There is the sedate "chicken run", the 50:50 chance of a flip "muncher" or "star trek". What had we let ourselves in for !!! A little wave of concern hit me when Blue, our guide, tightened all the lifejackets. There really was no option but to take star trek - if you are here, you have got to do it. It only took about five seconds from the "ooooohhhh my god" as we headed downwards, to the thrash splash bash, another thrash splash bash, the flip, the underwater calm and darkness, the "I'm underwater " feeling, the "I'm still underwater" realisation, the "am I going to surface" question to the bob up into the foam. What a laugh. Then stupid me held on to the wrong bit of the boat whilst righting it and ended up with a second dunking. This was to be our only flip and we were proud to have done it on this rapid. The many near misses were just as exciting though as you are holding on and whizzing past the froth with your body almost parallel to it. 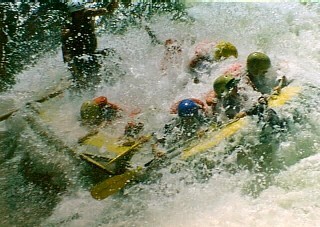 The absolute exhilaration you feel going through the rapids is fantastic. This was not an experience to be missed. Rapid 9 "commercial suicide" was not for us - we had to get out and walk around it. Only the worlds lunatics go down that one and even the sight of it was enough to book the undertakers. In total we rode 34 rapids as there are a's, b's and c's on some of them. It was just as well that the adrenalin level was high to tackle the climb up the gorge afterwards. Thankfully the cold beers were waiting at the top and a delicious braai waiting at the lodge. After having a laugh at our days video we were in the lorry and whisked back over the border to Zim. Aching bodies and lots of bruises were in store for us the next day. We were disappointed that the "weekend" greeted us with rain but it soon cleared up and we were able to spend a bit of time in the pool and topping up the tan in the 30°C heat! On Monday 6th we crossed the border into Botswana to meet up with Gordon for an adventure through Chobe. You can get Wimpy burgers, fish 'n' chips and ice creams in Vic Falls - just like Blackpool without the lights. Bulawayo and Harare have good supermarkets and the Gouda cheese is a good buy. Outside town you have to rrely on street markets which have good fruit and vegetables. Bulawayo restaurants tend to close at around 10pm. This is well travelled country but be prepared for "bush" exchange rates which differ greatly from the bank rates. Zim is very very cheap. There are a number of banks in town with ATM's accepting cirrus. Although Zim has its own currency - the Zim dollar, they prefer to use the US$. If you pay for the activities by cash then you have to pay an extra 15% duty so it is better to pay by credit card. If you pay by credit card then the US$ is converted to Zim $ at a terrible rate. You cannot win. You can nip over to Zambia for a day for 10 US$ (unless you are from a country where a visa is not required or unless you are "introduced" by a tour company, i.e. 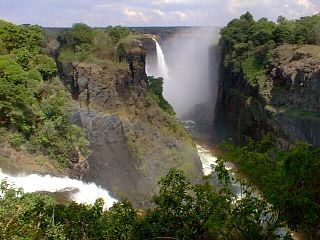 book an activity in Zambia). Livingstone is only 7km away and you can hire a cycle for a couple of quid for the day. Bungee jumping will set you back 90 US$. The Vic Falls bridge is an impressive place to leap from but is no longer the worlds longest drop - that honour now belongs to SA at Knysna (250m apparently). Saf Par is definitely recommended for a day of rafting. As of mid-December there is a US$5 fee to visit the Vic Falls park on the Zambia side.